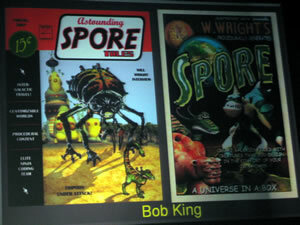 Today was “Spore Day” at GDC with four different talks concerning Spore, and I was at every single one of them. But just how much new information was revealed during these talks? And what new revelations did Satoru Iwata reveal about the Revolution? This and more on today’s show! Oh yes, and once again I share the mic, today with John Callaham from FiringSquad. Enjoy! John and I discuss Spore talk number one: “Advanced Prototyping” with Chaim Gingold and Chris Hecker. We discuss the Nintendo keynote speech. Will Wright talks, but does he say anything? John gives us a rundown of the expo floor. A review of this year’s “Game Design Challenge” and why was Will Wright wearing a tiara? Spore talk number three: “Spore: PrePD Through Prototyping” by Eric Todd. And finally Spore talk number four: “Building Community Around Pollinated Content in Spore” by Caryl Shaw. A recap of last night’s Independent Game Festival & Awards and the Game Developers Choice Awards. Download the show (55 minutes): Gaming Steve Episode 45 (MP3).